Background/Purpose: Lesinurad is a selective uric acid reabsorption inhibitor approved in the United States and European Union at 200 mg daily dose in combination with a xanthine oxidase inhibitor (XOI) for treatment of hyperuricemia associated with gout in patients unable to achieve target serum uric acid on XOI (allopurinol or febuxostat) alone. Approval of lesinurad was based on three pivotal, placebo-controlled, 12-month phase III (core) studies evaluating lesinurad 200 mg (LESU200) and 400 mg (LESU400) in combination with XOI. Patients completing core studies were eligible to enter extension studies, continuing LESU+XOI at the same dose or randomized from placebo to LESU200 or LESU400 plus XOI. 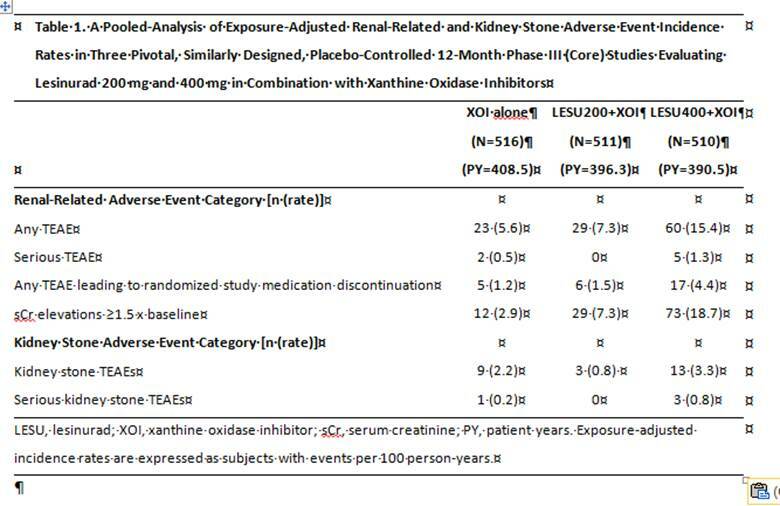 Methods: Renal-related and kidney stone safety data were pooled from core studies to compare LESU200+XOI and LESU400+XOI with XOI alone and from core studies + extension studies to evaluate the impact on renal safety of extended LESU+XOI treatment. Renal-related treatment-emergent adverse events (TEAEs) were a customized list of 36 preferred terms selected from the Medical Dictionary for Regulatory Activities (MedRA) Renal and Urinary Disorders System Organ Class (SOC), the Investigations SOC and the Acute Renal Failure MedRA Standardized MedRA Query (SMQ). Descriptive statistics are provided for patients receiving ≥1 dose of study medication. To adjust for varying treatment duration, TEAEs are expressed as exposure-adjusted incidence rates (EAIRs; subjects with events per 100 person-years). Results: In the core studies, EAIRs for any renal-related TEAE, serious renal-related TEAEs, and renal-related TEAEs leading to discontinuation were similar with XOI alone and LESU200+XOI and lower than with LESU400 +XOI (Table 1). Similar results were found for kidney stone and serious kidney stone TEAEs. The most common renal-related TEAE was increased serum creatinine (sCr). EAIRs for sCr elevations ≥1.5x baseline were higher with LESU+XOI than XOI alone (Table 1). Overall, 75% and 84% of sCr elevations in the XOI alone and LESU+XOI groups, respectively, were resolved at last study assessment; 75% and 66% resolved without interruption of medication. 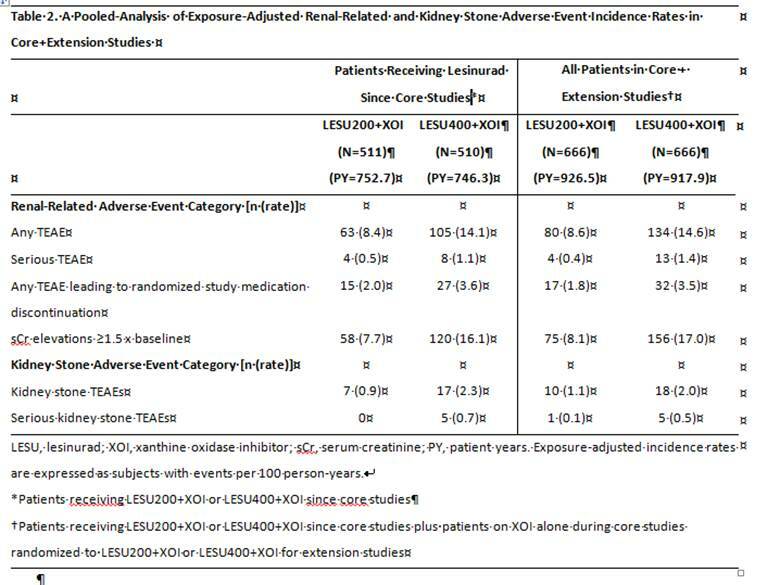 Exposure to extended LESU+XOI treatment in core+extension studies did not show an increase from core studies in EAIRs for any renal-related or kidney stone adverse event category (Table 2). Conclusion: Lesinurad at the approved dose of 200 mg once-daily combined with XOI demonstrated comparable rate of adverse events to XOI alone. There was no clinically relevant increase in these adverse events with the extension of treatment beyond 1 year. Disclosure: R. Terkeltaub, Aequus BioPharma, 5,Ardea/Astra-Zeneca, 5,Revive, 5,SOBI, 5,Selecta, 5,Relburn, 5,ProThera, 5,Horizon, 5; R. Malamet, AstraZeneca, 3; K. Bos, AstraZeneca, 3; J. Li, AstraZeneca, 3; D. Goldfarb, AstraZeneca, Revive, Cymabay, Retrophin, 9; M. Pillinger, None; D. Jalal, None; J. Hu, Ardea Biosciences, Inc., a member of the AstraZeneca Group, 3; K. Saag, Ardea/AstraZeneca, Horizon, Takeda, 5. Terkeltaub R, Malamet R, Bos K, Li J, Goldfarb D, Pillinger M, Jalal D, Hu J, Saag K. Renal Safety of Lesinurad: A Pooled Analysis of Phase III and Extension Studies [abstract]. Arthritis Rheumatol. 2016; 68 (suppl 10). 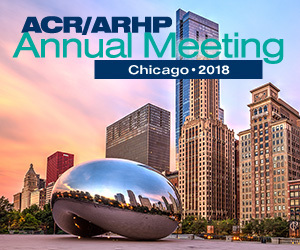 https://acrabstracts.org/abstract/renal-safety-of-lesinurad-a-pooled-analysis-of-phase-iii-and-extension-studies/. Accessed April 22, 2019.